With over 200 staff, and offices across Sussex, Surrey, Hampshire and London, Henry Adams provides a complete property service, covering residential, commercial, holiday lets, agricultural land, great country houses and grand London residences. It also has a fine-art auction business. Such a diverse business needs a strong brand to unite it. Henry Adams didn’t have one: each department effectively produced its own materials, with only the logo and colour scheme consistently applied. So, we began by holding a brand workshop, bringing people from across the business together for what was actually the first time. Conclusion: revolution, not evolution, was needed. Our brand strategy brought clarity and focus. We reduced an unwieldy 20 services down to a tight, solid five, and created a new logo based on equilateral triangles. This captures the idea of all parts of the business being equally important and free to act independently, but all moving forward together as one united brand. We also canvassed customers, translating their needs and feedback into an altogether softer, more approachable look. Our confident duck-egg and aubergine palette moved the brand further upmarket, with the practical benefit that the colours stand out boldly and clearly against greenery and buildings. We combined four separate websites into one, introducing a humanity and customer focus while elevating and cross-selling the brand. As well as showing the business’s full scope, the site is structured so users pass through ‘brand’ pages to reach the sales details, making the whole experience more personal and less pushy. It’s approachable, professional and distinctive, inspired by the simple truth that, in the end, people buy from people. 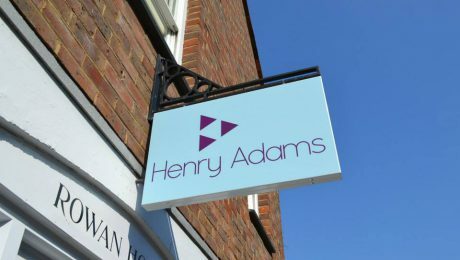 All 13 Henry Adams’ residential sales offices in Surrey, Sussex and Hampshire will be re-branded, as will the busy lettings offices in Horsham, Midhurst and Storrington. The new brand is already in place across cars, signage, displays, banners, merchandise, marketing boards, press ads, sales literature and interiors. 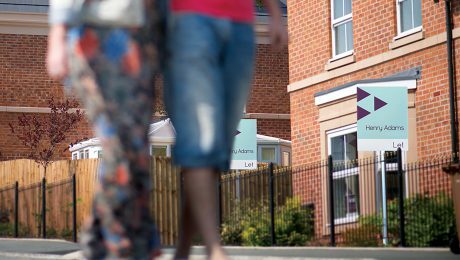 "THIS IS AN EXCITING TIME FOR HENRY ADAMS, AND WITH OUR NEW SOFTER, FRESHER IMAGE, AN EXCELLENT PLATFORM TO FACE THE FUTURE."